Uglyworld #915 - Hogmany (1-365 - Project BIG), originally uploaded by www.bazpics.com. Hi everyones, for those of yous who doesn't alreadies knows me I am Babo, from Uglyworld and I've beens here visitings Earth now for some years alreadies, and wanteds to explains many things to yous all this year. As it just becomes the 1st of January's and I is in Scotland (checks out my new cools t-shirt) I has no option than to explains the awesomes celebration of Hogmanay. There is manys customs, boths national and locals, which is associateds with Hogmanay. From what I learneds tonight the mosts widespread nationals custom is the practices of what peoples call 'first-footing' which seems to starts immediately afters midnight. It seems that this involves being the firsts person to crosses the thresholds of a friend or neighbour and oftens involves the givings of symbolics gifts likes coals, shortbreads and whiskys, which is all intendeds to brings different kinds of lucks to the householder. 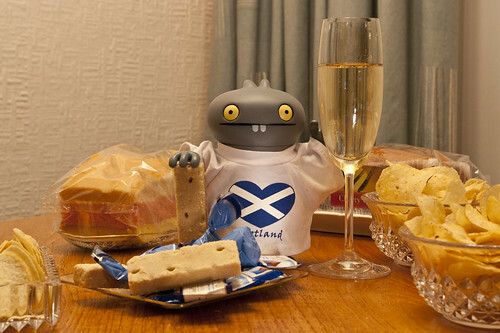 There is lots of foods and drinks for everyones, you can sees I has shortbreads and champagnes, and I has been tolds that this may goes on throughouts the early hours of the morning and well intos the next days. The person who does first-footings is supposeds to set the lucks for the rests of the year. Traditionally, tall darks men are preferreds as the first-foot. I also learneds that the favourites song here in Scotlands is "Auld Lang Syne" which was a traditionals poem which was reinterpreteds by the famous Scotsman Robert Burns, which was laters set to music. From me and all my friends arounds the world, I hopes you all has a happy new years!! !